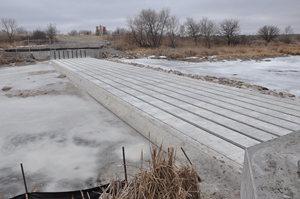 Installation is complete on what amounts to a large electric gate that’s intended to keep more unwanted carp from moving into the Iowa Great Lakes. Iowa Department of Natural Resources fisheries biologist, Mike Hawkins, says two species of invasive carp were discovered in the lakes and it’s believed they swam in during the flooding in 2011. “At this point, all of our data and investigation indicates that fish did make it in — both bighead and jumping silver carp made it in — but it looks that they’re are at a low enough density that we’re not going to have an incident, or kind of a low probability of an incident,” Hawkins says. “That’s kind of the community’s goal here, to keep it that way. We don’t want to accumulate any more of them through future flood events.” The two types of carp have been rapidly spreading throughout the Mississippi and Missouri Rivers since they escaped in the 1980s. They take over and push out other species of fish, and the jumping silver carp have become infamous for doing what their name says — jumping out of the water and into boats. Hawkins says the fish fence now in place is made up of electrodes in a 21-foot barrier on top of the dam at the outlet for the lakes. The electrodes create an electrical barrier. “As a fish approaches from downstream, they’ll encounter this electrical field most of the time before they even encounter the top of the deck. Fish are very sensitive to electrical fields in water, and most fish won’t even challenge the structure, they’ll just stay away from it,” Hawkins explains. “If a fish does challenge it and try to get over the top of the dam, they can actually get immobilized, and the current will push them down the stream.” It is not believed any of the carp currently in the lakes will reproduce. Hawkins says this type of barrier does not take a lot of electricity to work, and doesn’t cause other problems along the dam. “One of the huge benefits of an electrical barrier is there is nothing in the water that can catch debris or cause problems with flow and impact water levels,” Hawkins says. The barrier costs nearly $961,000. Local fundraisers took care of $400,000 of the cost, the Iowa DNR contributed in $300,000, and our neighbors to the north also kicked in. “The Minnesota DNR through their outdoor legacy funding came through with $261,000 for the project. And that was because of the threat to some of the Minnesota waters just across the border here,” Hawkins says. “We’re sitting nearly on the border and the watershed or the land area that drains into the great lakes comes out of Minnesota, part of it does. So this barrier will protect a number of water bodies in southwest Minnesota.” Hawkins says the barrier is working and the only work left on the project is to some restoration around the site. He says they hope the barrier will keep the unwanted fish out and protect the lakes, which are a major tourist attraction for the state.